Music City has seen a lot of growth over the past decade. Forbes ranked it as the 20th fastest growing city in 2015. Rich Scaglione of Locomotion Creative moved to Nashville 28 years ago and has no plans of living anywhere else. He stated, "The city is growing, the economy is almost recession-proof (healthcare, government and higher education are three of our biggest employers), the music and creative vibe makes Nashville cool for young people, the weather is great — you an go on and on." And he's not wrong. With over 23,000 employees, Vanderbilt University and Medical Center is the largest employer in Nashville, and the second largest in the state. 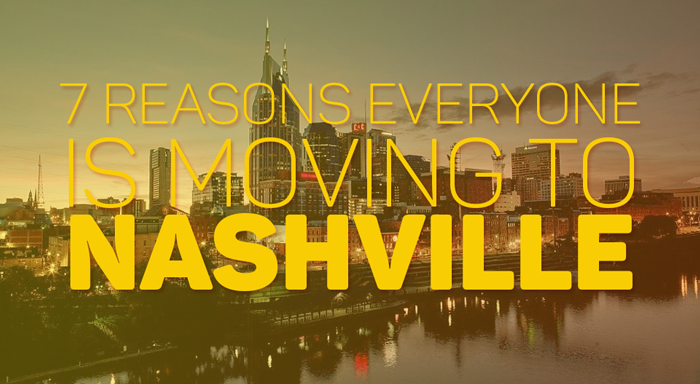 Experts estimate that an average of 85 people moved into the Nashville area daily last year. Ryan Carrigan, co-founder of moveBuddha, says that a majority of the people he's seen move into the area have done so for tech-related jobs. While there is no doubt that Nashville's job market is strong, others love the entrepreneurial climate that the city provides. Ryan Thewes, a local architect, says, "The low cost of living and no state income tax makes it very appealing from a business perspective". In fact, Thumbtack gives Nashville an A+ for overall friendliness towards small business and ease of starting a business. Thewes went on to say, "A strong art, music and food scene lends a cosmopolitan and progressive atmosphere to a city that was previously viewed as traditional". From the job market and steady economy, to the music and entertainment offerings, Nashville caters to the young and old. Our infographic below takes a look into seven major reasons that everyone is picking up and heading to Nashville. If you’re a Nashville resident looking for lawn service, check out our Nashville lawn care page to see how easy it is to schedule service for your home.